"One for all and two for five, we're four of the three musketeers". These lines from Musketeers by Bert Kalmar and Harry Ruby in the stage version of Animal Crackers expresses the zany, loyal camaraderie that glued the Marx Brothers together. There were of course five musketeers and their loyality engulfed all of their family, both in the past, in the presence and in the future. Their father Sam was born in October 1860 in the French province of Alsace (annexed by Germany after the Franco-Prussian war of 1870-71), hence Sam's affectionate family nickname of "Frenchie". Groucho at one point names the town of Strassbourg and Belgian Marx-fan and genealogist Jurgen De Clercq has found that Sam lived in the Alsatian town of Mulhouse, and possibly emigrated to America from there. Maybe he was born in Strassbourg and moved to Mulhouse later. The original first name seems to have been Simon, whose Jewish Yiddish cognomen of Shimen might have mutated into Shmuel, Samuel and finally Sam. The family tale gives him the original last name of Marrix, but there is no verifiable trace of this. His marriage certificate names him Marks and lists his father as Mark Marks and his mother as Hanne. The marriage took place on 18 January 1885, with Simon/Samuel marrying another German immigrant, Minnie Schönberg. Born in Prussia on 9 November 1864 as Miene, later Minna, she had arrived to the new land with her parents Levy "Lafe" Schönberg (1823-1920) and Fanny Sophie Salomons (1829-1901), sisters Schontje (born 1850), Celine, Sara (born 1858), Jette (1859-1862), Hannchen (alias Hannah, born 1862), and brothers Abraham Elieser Adolph (alias Al Shean , 1868-1948) and Heine/Heinemann/Henry ("Harry Shean", born 1873). The musical and theatrical talents came from the Schönbergs and legend has it that Grandpa Lafe was a famous magician and ventriloquist back in Germany in the 19th century while Grandma Fanny played the harp. Manfred, the first Marx Brother, was born in January 1886 but survived for only a couple of months. A death certificate of the Borough of Manhattan (unearthed by Simon Louvish) reveals that he died aged seven months on 17 July 1886 of "entero-colitis, with asthenia contributing", i.e., probably a victim of influenza. He is buried at New York's Washington Cemetery beside his grandmother Fanny Schönberg, who died on 10 April 1901. According to Groucho, mother Minnie once said: "Sam can cough all night and I never hear him, but if one of my boys coughs just once, I'm wide awake". With the sad fate of Manfred in mind we can appreciate that statement more fully. It was probably because of Manfred's death that Chico, the eldest surviving son, was showered with his parents' frustrated love. He was born on 22 March 1887 as Leo (a probable Americanization of the name of grandfather Levy), which later mutated into Leonard. Harpo was born on 23 November 1888 and was originally named Adolph after his famous uncle Abraham Elieser Adolph "Al" Shean. The nickname Ahdie often became Artie, which paved the way for a later change to Arthur. And contrary to popular belief, Harpo made the change from Adolph to Arthur long before that Austrian corporal rose to power in Germany. Next in line was Groucho, born Julius Henry on 2 October 1890, followed by Gummo who was born Milton on 23 October 1892. Zeppo, the late addition born on 25 February 1901, always felt the weight of four living brothers and a dead one (he was even named Herbert Manfred) bearing down on him. 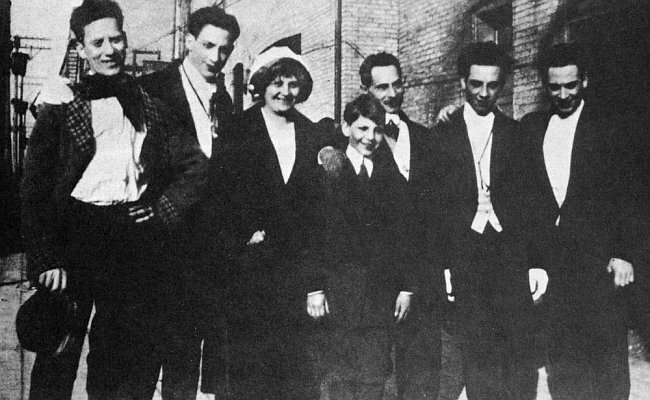 The short life of Manfred Marx probably shaped his surviving brothers more than might have been realized before by the way they came to be treated by their parents. As it happened, Chico was a fiercely protected child, favoured over and above the others, and particularly over Groucho, whom Minnie often referred to by uneasy terms like der Eifersüchtige ("the jealous one") or der Dunkle ("the dark one"). "I wonder what would have become of Mannie", Groucho wisely pondered in an interview with Charlotte Chandler in the book Hello, I Must Be Going, and we might as well wonder what would have become of the Marx Brothers if Mannie had survived. Pauline, a daughter born in New York in January 1885 was also listed as one of the children of Sam and Minnie Marx in a city census made on 8 June 1900. She was in fact the daughter of Minnie's sister Hannah, thus a cousin of the Marx Brothers who'd (as Harpo wrote in his autobiography) "been adopted as one of us". The paternity of Pauline is unclear as Hannah, under the name Joanna Lefevre, is listed as a widow in the Manhattan City Directory of 1890-91. In 1881, Hannah had married the grocer Max Lefevre, father of Hannah's first child Louis (who enjoyed a brief career as Lou Shean together with Chico circa 1911). If Max Lefevre was proclaimed dead after the standard vanishment of seven years, this would preclude him from having fathered Pauline. Also, with Sam and Minnie's marriage revealed as 18 January 1885, instead of the stated year of 1884, they've clearly moved their marriage back a little to accommodate Pauline's birth in January 1885. It was probably a necessary protection if Pauline was illegitimate in an age when that stigma could destroy lives. Nevertheless, the presence of Pauline (a.k.a. Polly or even Sally, as Groucho named her in his autobiography) meant that the Marx Brothers grew up from their early childhood with an elder sister. This solemn and older foil may in fact have been an embryonic Margaret Dumont for the growing mischief makers, and the character Peerless Pauline in At the Circus may be named after her. In 1903, Polly (still registered as Pauline Marx) married a tailor named Sam Müller. They had four children and were still in the family fold in 1932, when a panoramic photo-portrait of a family reunion in New York show them present with their eldest daughter Beatrice (another female name that popped up years later in one of the Marxes' films, A Night In Casablanca). Aunt Hannah (under the name of Johannah Lefever) had married one Julius Schickler in 1892. Groucho claimed to have been named after Schickler, owing to Minnie's misconception that he was a man of means, although (as Groucho later claimed) it turned out that he was not only without funds, but owed Sam Marx thirty-four dollars. The Henry added to baby Julius' name was probably in honour of Minnie's and Hannah's brother Heinie. A possible seventh Marx Brother was discovered by Simon Louvish in a city census of 1905. This census records a younger Marks child after Herbert as "Sam - age three"! In later years there was said to be a relationship with a Samuel Marx, a 1930s Hollywood story editor and producer for MGM Studios who did claim to be a distant relative of the Marx Brothers in his own book A Gaudy Spree, published in 1987. As this Sam Marx was born in 1902, the possibility that he was the lost seventh brother is delicious but unsupported by the facts which record his father as Broadway theatrical tailor Max Marx. Louvish speculates that baby Sam ("as a distant cousin") may have visited Frenchie's household on that census day of 1905 and got caught up in early Marxian mischief. There was yet another Samuel Marx in New York, a powerful Tammany Hall politician, and according to the Marxian family tale it was in order to get a spurious family relationship with him that Frenchie changed his last name from Marrix to Marx. Louvish has found no real evidence of any blood relationship between all these Marxes, although in his autobiography, Harpo included all of them in the family as "cousins"; "Sam Marx ran an auction house near the Grand Army Plaza, and he was a wheel in Tammany Hall. Sam's younger brother, Cousin Max, I didn't know so well. He was a theatrical tailor and a good one, so Frenchie was leery of talking shop with him and preferred to remain aloof. I thought 'Max Marx' was about the dandiest name a man could have, with the main exception of 'James J. Jeffries' ". Whose cousins these Marxes were supposed to be is unclear, especially as Harpo in a later passage confuses the relationship further by mentioning that he never got arrested while perusing the streets of New York as a juvenile delinquent because "my Uncle Sam the auctioneer, don't forget, was a wheel in Tammany Hall. Nephews of men in the Organization did not get arrested. ".